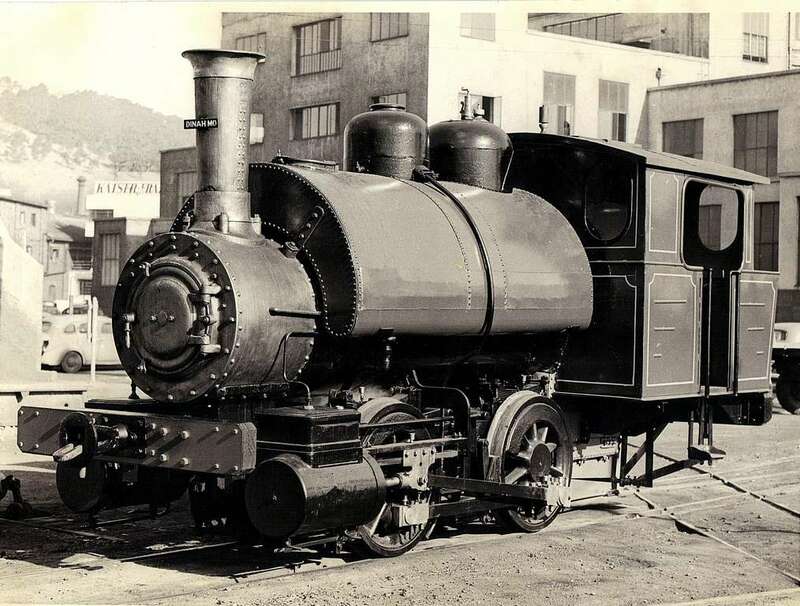 This Locomotive, built by the Brooks Locomotive and Machinery Co, New York, USA, is plinthed in a Children's play park in Claremont, Cape Town. The little engine was built in 1896 as Brooks works number 2725. It started its service life as number 1 at the Transvaal & Delagoa Bay Collieries Ltd. near Witbank. Coincidentally another Transvaal & Delagoa Bay Collieries Witbank workmate is now plinthed at nearby Intaka Island at Century City, Cape Town. At some stage the locomotive became the property of the City of Cape Town Corporation (City Council) and was used a shunter at the Dock Road and the Table Bay power stations on the Cape Town foreshore. The locomotive now got the name "DYNA-MO". Image (possibly taken in 1951) of "DINAH MO" - courtesy of Ian Goldie. In October 2011 Ian Goldie wrote: "In the late sixties, I worked for Imperial Cold Storage (ICS), which was right next to the power station, I was lucky enough to be able to go in and take some photo's of the Brooks Locomotive before I left ICS. Whilst I was busy taking the photos, one of the engineers came over, and showed me a picture of her. I am not sure, but I think he said that it was from when she arrived, or shortly after/before she went into service at the power station, that is after an overhaul. 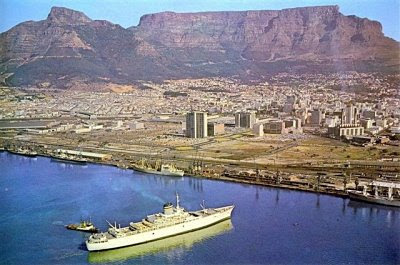 I enclose a copy of the photo which is a official photo, as it has a City of Cape Town stamp on the back reading "City of Cape Town, Drawing & Photo Section, date 16-3-1951 No 1965". 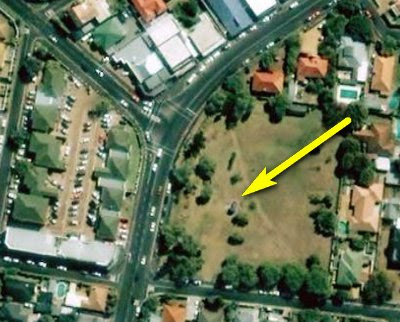 This is where the Brooks locomotive worked at some stage of its life. 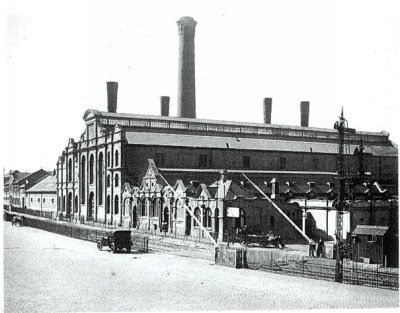 The Cape Town City Council had a power station in operation at [the old] Dock Road, which was opened on 14 April 1904. The first turbine driven alternators at the Council's Dock Road Power Station were installed in 1913 and 1914. It was decommissioned on 5 September 1961 and demolished during 1962. 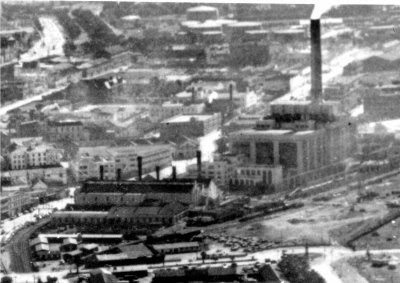 The Dock Road power station stood approximately where Lower Long Street has been built and was adjacent to the Table Bay Power Station commissioned in 1939. This early 1940's picture kindly provided by Andy Selfe : Stage one of the Table Bay Power Station has been commissioned, stage 2 is yet to be built. The picture also shows the old Dock Road power station. Horatio G. Brooks began his railroad career during the construction of the New York and Erie Railroad. At the time of its completion, in 1851, it was the longest railroad in the world. The six foot gauge railroad connected Piermont on the Hudson River with Dunkirk, New York on Lake Erie. During his career with the Erie, H. G. Brooks worked his way up from a locomotive engineer to superintendent of motive power and machinery for the entire railroad. He was at the controls of the first train to arrive in Dunkirk over the new road when it opened. Shortly after the opening of the line, the Erie opened a branch from Hornell to Buffalo. It was soon realized that Buffalo, and not Dunkirk, would be the major Lake Erie port for New York State. The Erie soon abandoned its shops and relocated them to Buffalo. This resulted in the loss of what was Dunkirk's largest employer. In 1869, Horatio Brooks came to the rescue. He leased the former Erie shops and founded the Brooks Locomotive Works. 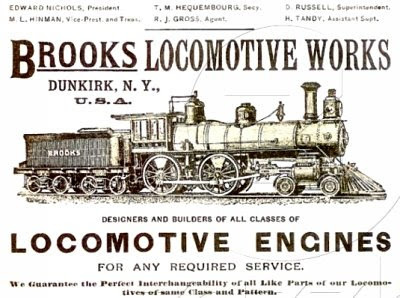 The Brooks Locomotive Works was officially formed on November 11, 1869. The initial capital stock of the company was valued at $350,000.00. It was subsequently raised to $500,000.00. The Trustees for the new company were: H.G. Brooks of Dunkirk; M.L. Hinman of Brooklyn; M.R. Simons, J. H. Bacon, and W. O. Chapin of New York City. The first executive officers were: H.G. Brooks, president and superintendent; M. L. Hinman, secretary and treasurer. The capital allowed Brooks to expand the facility into one of the largest operations of its kind in the state. Soon he was producing seven locomotives per month, compared to one a month when the Erie ran the shops. During the first year of operation, 37 locomotives and 100 freight cars were produced. During the second twelve months of operation, 43 new locomotives were built. Most of the major railroads of the time could be counted as customers. The financial crisis of 1873 caused business to fall off dramatically, but it began to recover within a few years. By the 1880's the economy had improved and the future looked better for the Brooks Works. In 1883 Brooks locomotives were judged Best in Show at the Chicago Industrial Exposition. The 1000th locomotive was completed February 22, 1884. The early 1890's brought another financial depression upon the country. This poster dates from 1890. In 1891 Brooks built 226 locomotives. In 1894 total production fell to 90 locomotives. Prosperity did not return to the Brooks works until after the turn of the century, when it became part of the American Locomotive Company. In 1901 the Brooks Locomotive Works merged with the Schenectady Locomotive Works, and several other locomotive builders, to form the American Locomotive Company. The Dunkirk works grew steadily, and by 1921 employed about 4500 people. The last steam locomotive was produced in 1928. After that, production of steam locomotives in New York state was shifted to the Schenectady works. 2: Industrial Locomotives of South Africa 1991 by John Middleton & Huw Williams.